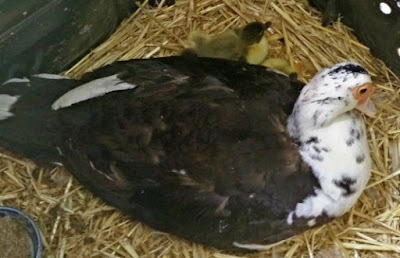 As I sit here and write this, we have two ducks (Crystal and Thistle) who are brooding, with Crystal's eggs due to hatch today or tomorrow and Thistle's eggs due two weeks later. This will be our 3rd and 4th batch of baby ducklings, and each time we still learn something new and are getting better and better at the process. "If you have livestock you will have dead stock"
Which we realise if we are going to move to a farm and raise animals, this is something that we will have to get used to. I always get very attached to my animals and we spend a lot of time and money looking after them and making sure that they are as happy and well fed as they can be, so it is sad when you see that something goes wrong. This morning when we went to check the ducklings, we found a dead duckling that was not perfectly formed and was dead. It is always disturbing and sad to find something like that. We only have a small number of livestock at the moment, namely 5 ducks, and 1 hive of Australian Native bees. We also have several pets (2 dogs, 1 cat). Delta and Ducklings, one of them would be Thistle. When we have a batch of ducklings, we consider them as livestock, rather than as pets, as the original 5 ducks are, and do not name the ducklings, unless we decide that one of them will be kept, and then we will name them. We are thinking that we will keep and then slaughter a small number of male ducks from one of these batches, as we will need to start eating the ducks soon, if we want to start moving towards a semi self sufficient life style. This is something that I am not looking forward to, having to take the life of an animal that I would have seen born, but realise that is the natural cycle, and will give the animal the best life and death that is possible. I will have a friend that is a butcher come and help me with this the first time that I do this, and will research how to do it so that there is least stress for the animal. Since we can not yet determine the gender of the ducklings until they are older, we will not be able to determine which will be males and females, as we will also keep some of Crystal's ducklings to increase the size of the flock of females. We think that about 8 females is the right number for our one male (Donald) for the space of the yard we have here. We also think that 8 females should give us a sufficient number of eggs for us and our neighbours. Every hour or two, I continue to check in on the mother ducks and make sure that they are happy and healthy and have water and food, and to check for baby ducklings. The last few times we were able to tell that the ducklings had arrived by just walking near the duck house from the chirping of the baby ducklings, which is a very distinctive sound, and surprisingly loud for an animal that is so small. Once the ducklings have hatched I will put some photos up here.